Is it possible to change the color of a trail renderer n event (trigger enter, etc)? Absolutely, you could do it a few ways including through the use of the "set material color" action. 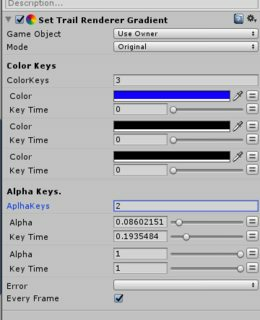 If you select the shader you want to use so that you can view its keywords in the inspector window, use that keyword in the "named color" part of the action, once that state is active it will change it to the colour you set. For example the particle shader I'm currently looking at has a "tint color" setting, the keyword for this would be "_TintColor". Sorry I didn't consider that, I actually looked for the same answer a while back and was told that Playmaker doesn't support gradients. I'm pretty sure I've used gradients on particles, but just to setup a black and white gradient, then I think I've controlled an overall tint through the material assigned to the particle. You may be able to go down that route. Best of luck with it!